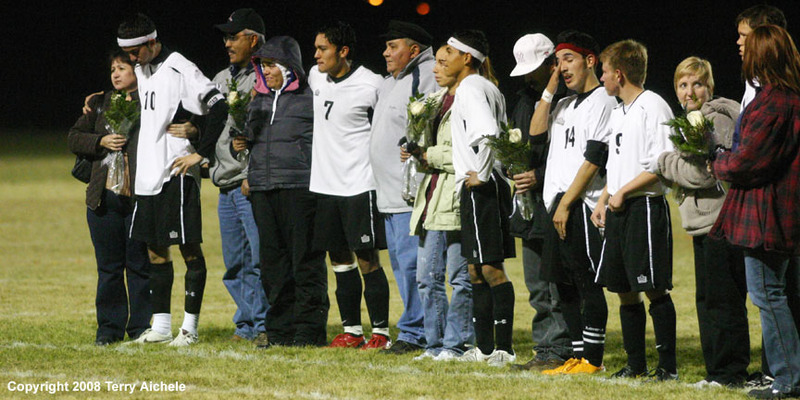 Irrigon senior soccer players line up with their parents during halftime of the match with Umatilla on Thursday. IRRIGON - Irrigon celebrated spirit week during the last week of October. 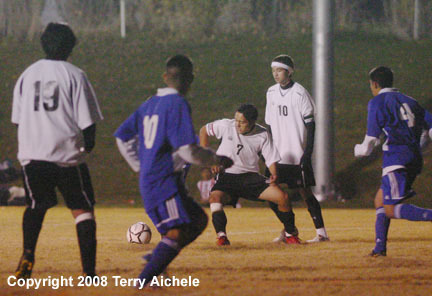 As part of the activities Irrigon hosted nearby rival Umatilla in soccer action. It was a fairly even match based on shots on goal. Umatilla was able to take the win 3-2 with a late second half goal. Umatilla scored the first goal less than two minutes into the first half when number 21 shot from the middle of the zone. 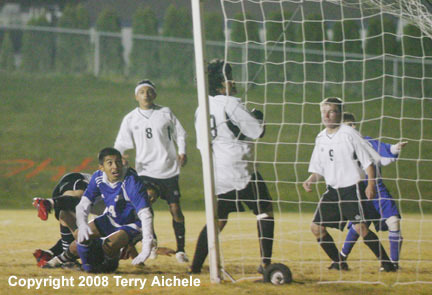 Then in the fifth minute of play Umatilla scored on a shot from a group of players in front of the goal. Umatilla had a 2-0 lead in the opening five minutes of play. Irrigon tightened their defense and switched goalkeepers to hold the Umatilla scoreless for the rest of the first half. Irrigon took several shots on goal the closest one to going in was probably by Ivan Diaz in the 38th minute. The teams played about 18 minutes in the second half before Irrigon got a chance to score. Irrigon was given a penalty kick which missed the goal. Irrigon's next opportunity was a free kick at the 22 minute mark. Cristian Hurtado nailed the shot from the left side of the zone for a goal closing the gap to 1-2. Irrigon scored again at the 33 minute mark to tie it up 2-2. The teams turned up the intensity in the last seven minutes of the match. Umatilla was given a corner kick in the 37th minute. 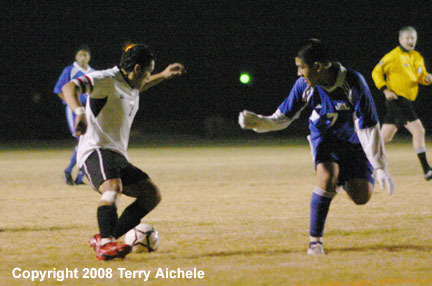 The long, crossing shot was headed in by Viking Samuel Navarette to give Umatilla the 3-2 win. 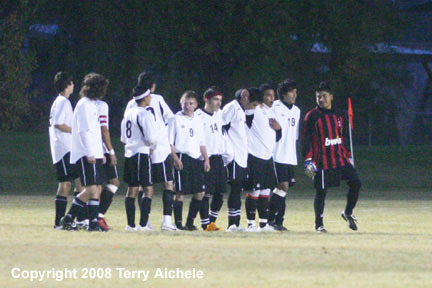 The 3A Special District 5 tournament action looks like this: Riverside will host the winner of the Westside Christian Eagles vs Santiam Christian Eagles game at LBCC on Saturday, November 1, 2008. The Riverside game will take place on Tuesday, November 4 time to be determined. Umatilla, the third place 3A SD5 team will play at Oregon Episcopol on Tuesday, November 4 time to be determined. 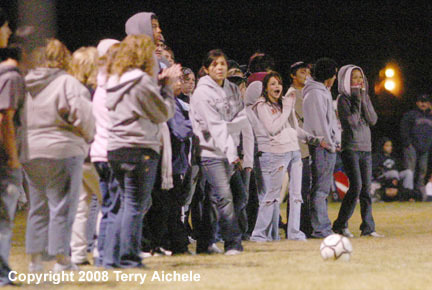 LEFT - Irrigon players are introduced to the home crowd on Thursday night. 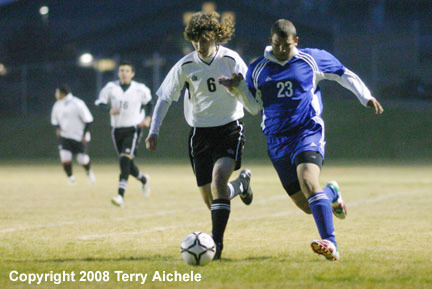 RIGHT - Ryan Young of Irrigon on the left battles Maximo Bedolla of Umatilla for control of the ball. Umatilla scores the first goal less than two minutes into the match. 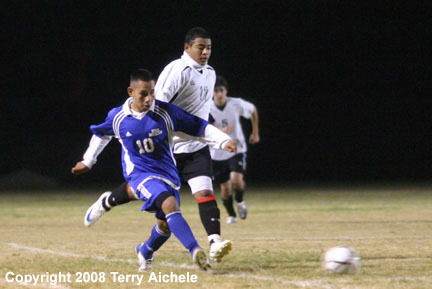 LEFT - Ivan Diaz eyes the ball in action in front of the Umatilla goal. RIGHT - Cristian Hurado brings the ball into the Umatilla zone. 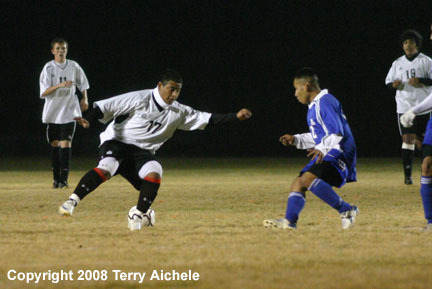 LEFT - Yeldar Orduna of Umatilla on the left takes the ball away from an Irrigon player. 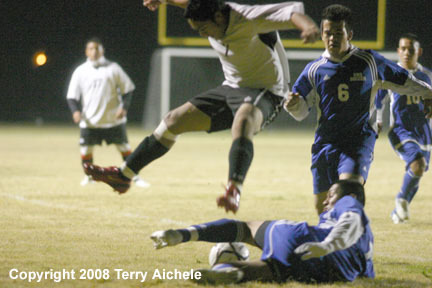 RIGHT - There was some high flying action as a Umatilla defender attempts to strip the ball away from an Irrigon player. 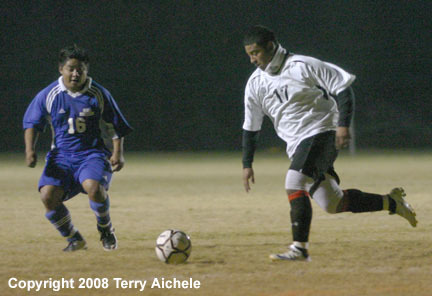 LEFT - Ivan Diaz of Irrigon on the left attempts to the drive to the goal against Umatilla's Jorge Campos. RIGHT - Irrigon cheerleaders were at the game. Ivan Diaz of Irrigon in the center of the photo threads his way through Umatilla defenders. LEFT - Yeldar Orduna of Umatilla moves the ball past Cristian Hurtado of Irrigon. 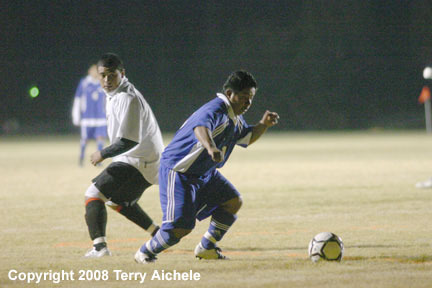 RIGHT - A Umatilla player gets around an Irrigon defender. Rosario Rios of Irrigon heads a ball away from the Knights goal during the second half. 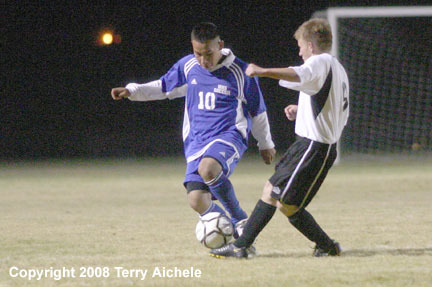 LEFT - Yeldar Orduna of Umatilla in blue battles for control of the ball with Ryan Young of Irrigon. RIGHT - Fans on the sideline react to the ball going out of bounds. A ball gets by the Umatilla goalie but misses going into the goal in the second half. 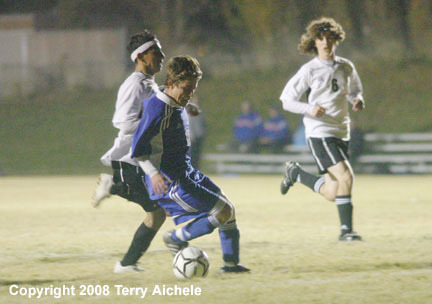 LEFT - A Umatilla forward gets past an Irrigon defender. RIGHT - Cristian Hurtado of Irrigon takes the ball out of the Knights zone while being guarded by Francisco Santiago of Umatilla. LEFT - Samuel Navarette of Umatilla, number 4 in blue, reacts to his header going into the net for the winning goal. RIGHT - Samuel Navarette of Umatilla, on the right celebrates the goal with a teammate. 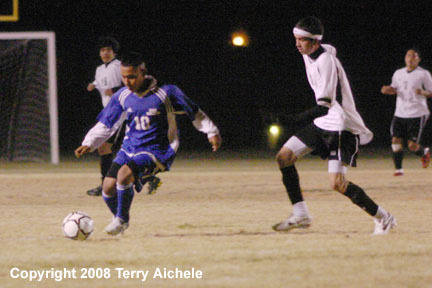 Rosario Rios of Irrigon heads the ball in the closing minutes of the match with Umatilla.